For people in a family with small children,Or those who just love to spend their free time, it is worth buying a swing for the villa. This entertainment was known in ancient Greece, but it has not lost its relevance in our days. Resting in the shade of trees, conveniently located on such a device for relaxation, you can enjoy socializing with your children or friends! 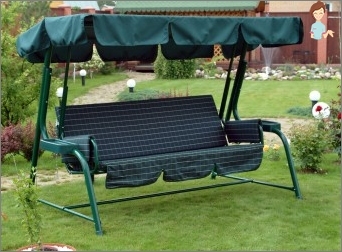 Dacha swings are not only designed forA comfortable stay during a vacation or a weekend at the cottage, but also create a unique cosiness and harmony in your garden. They have long ceased to be perceived only as a child's play. Summer residents consider them to be an indispensable attribute of a private plot, performing not only a practical function, but also an aesthetic one. The most convenient option is the hangingSwings for children. Only these models have a high amplitude of rocking, so they are suitable for older children. 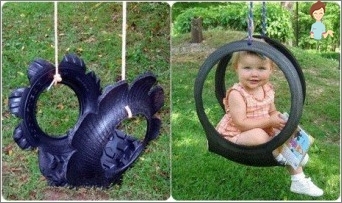 You can install the item anywhere in the backyard where children spend their time playing. If you rest in the country with very smallChildren, for the sake of children's entertainment, better acquire floor options. Such special devices have a convenient and reliable design, so you can be sure of your child's safety. Among adults, people enjoyModels of structures designed to rest several people at a time: so fun to rest on a swing in the company of friends! They can also be hanging or portable. Suspension devices are usually suspended in a gazebo or on a veranda, after all, so it will be possible to rest even during a bad weather. Choosing swings for cottages is not an easy task, becauseIt should harmoniously fit into the design of the garden. Before you decide on the type of construction, you must choose a place for it. In the gazebo or the depth of the terrace you can install both wooden and metal structures, because they will be protected from adverse weather conditions. 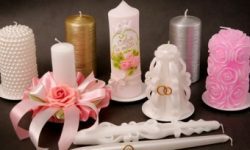 With this decision, the main thing is to pay attention to the dimensions of the objects, because not every design fits in the gazebo or on the veranda. If you purchase items for the streetThere are stricter criteria. First of all, you need to take into account the quality of the legs. If they are made on the basis of the legs of ordinary garden benches, then it is better to install such structures on the tile or on a compacted and pre-prepared plot of land. Not following this rule, the swing legs quicklyWill press loose ground under their weight or spoil your lawn. For lawn, sand and loose ground, only those legs that are in the form of arches are suitable. 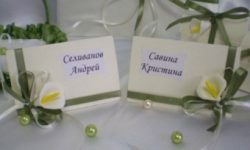 The cheapest devices areDacha rest, the frame of which is made of steel pipes, and the seat and backrest - made of plastic or fabric. The main advantage of such recreational facilities is their low cost. In addition, such structures are easy to clean, disassemble and transport. Steel pipes, of which the frame consistsMetal swing, covered with a special polymer paint, which has an increased anti-corrosion property. The seats in such products are made perforated. In the current market of products intended for the development of the suburban area, models are presented in which the seat frame is made of galvanized steel. People who prefer naturalMaterials, acquire a wooden swing for the country. Among the wooden swings can be found as simple options available for most dacha owners, as well as elite models that will give your garden a luxurious look. The wood must be impregnated with special solutions that protect the material from fungi, insects and other pests. Also, the material must have water-repellent properties. Bed- or sofa-swing - favorite modelSummer residents who value comfort and convenience. They can be both wooden and metal. The main advantage of such designs is the ability to fit into the environment, becoming its continuation. Having bought a swing-bed for a summer cottage, you can spend time in the garden reading your favorite book, or just sleep in the fresh air, strengthening your body. It is not necessary to buy such garden elements inShops, at desire it is possible to make a swing for a summer residence the hands. 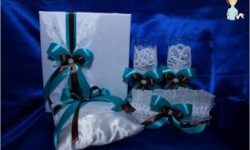 There are many simple ideas that can be translated into reality using existing materials. 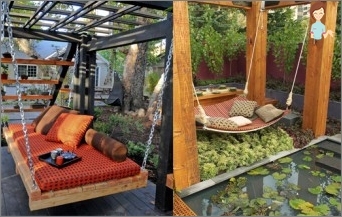 The wooden pallet that you left afterConstruction works, can become the basis for a garden swing. In addition to the pallets, you will need a strong rope and a solid wood on which you will place the finished structure. If there is no suitable tree in the garden, you can dig in the ground pillars-pillars. People who do not have time to makeGarden swings with their own hands, can simply attach the rope to the pallet and hang it on a tree or pillars. If desired, you can do creativity by attaching a backboard to the pallet and painting the finished structure. If your child has a skateboard broken, and the boardFrom him remained, this product can be given a second life. The boards used to make this kind of sports equipment are very durable, they withstand heavy loads. Such boards can be safely used as a seat for a swing. To the garden object for entertainment was as safe as possible, the main thing is to secure the ropes securely on it. The construction of such an adaptationThe playground begins with the construction of pillars, which are connected at the top of the transverse bar. Screws with rings are screwed into this crossbar. To hang the tire, use a strong rope, attach one end to the tire, and the second - thread into the ring. Securely secure the swing-tire from both sides. Instead of a rope for greater reliability it is possible to use chains. As a building material for the construction of a swing, you can use any material - logs, beams, planks, even seats from a chair or chair. Having installed such a useful construction on your home plot, you will be able to have a wonderful rest at the cottage and give pleasure to your children!